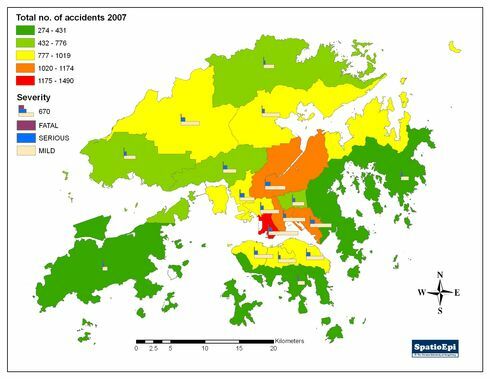 The map shows the distribution of road traffic accidents by district and severity in Hong Kong in the year 2007. "Severity" is divided into three categories as represented by bar charts: fatal (maroon), serious (blue) and mild (sand). The total number of road accidents is represented by graduated colour, from green to red (least to most). Data were obtained from the Transport Department, HKSAR Government. By district, Yau Tsim Mong had the highest number of traffic accidents, totalling 1490, followed by Shatin, 1146 and Kowloon City, 1114. 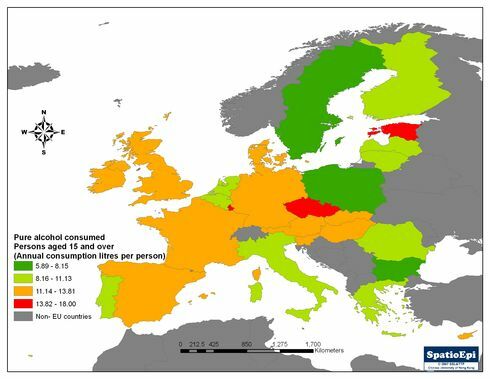 Districts having the highest number of accidents did not necessarily mean high fatality. The number of fatal cases was highest in Sham Shui Po (19), followed by Kwai Tsing (14) and Yuen Long (13). "Dangerous driving" is penalised by a maximum fine of HK$25,000 and imprisonment for three years. The convicted is disqualified from driving for not less than 6 months on first conviction and not less than 18 months on second or subsequent conviction. It is mandatory to attend a driving improvement course and that 10 driving offence points are deducted. In addition, "Dangerous driving causing death", is penalised by a maximum fine of HK$50,000 and imprisonment for 10 years. The driver is disqualified from driving for not less than 2 years on first conviction and not less than 3 years on second or subsequent conviction. He/she is mandated to attend a driving improvement course and the conviction incurs 10 driving offence points.